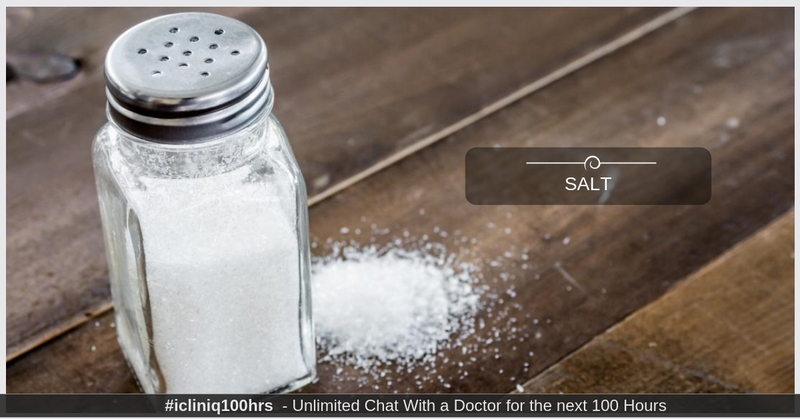 iCliniq › Ask a doctor online › Health Articles › Hypertension › How Much Salt Should One Person Have? How Much Salt Should One Person Have? Salt remains one of the essential ingredients in a person’s diet. The flavoring agent is added to almost every kind of food, even some sweet preparations (take a look at the covers of those chocolate biscuits you love - Yes! Surprise surprise, salt is there too). It is also contained in most of the food materials, vegetables, etc. It has always been advised that the person in an average diet, should restrict the consumption of salt to 2300 mg/day. Of course, it’s common knowledge that patients with cardiac conditions and hypertension should have a lower sodium intake (approximately 1550 mg/day). The latest recommendations are lesser - 2000 mg per day - consumption of salt. American Heart Association, of course, prescribes a much lower intake of salt- 1500 mg/day. It is of interest that the highest salt intake has been found in Kazakhstan (6000 mg/day) and the least intake was found in Malawi (2000 mg/day). The most common source of sodium in the diet is usually canned foods and commercially available foods. Salt and soy sauce added during cooking increase substantially and significantly the salt content of the food. Most of the salt ingested in food is largely excreted by urine (almost 90%). How Can Excess Salt Affect One's Body? A significant relationship has been found and known between hypertension and salt intake or with sodium excreted in urine. Higher the salt intake, higher is the excretion. So, of course, both are related to hypertension. A direct relation has been found between the reduction in salt intake and lowering of blood pressure. Excess salt in the diet leads to fluid retention thereby raising the blood volume. This results in high blood pressure and symptoms of breathlessness and limb swelling in the short term. Over the longer term, high blood pressure can cause kidney and heart disease, heart attacks, heart failure, Meniere’s syndrome (A kind of inner ear disorder that also affects balance) and pre-menstrual syndrome. Hypertension, of course, is a multifactorial disease and therefore there are other features affecting the blood pressure, inclusive of alcohol intake, high body mass index, genetic defects, and low potassium excretion. What Are the Options to Replace Salt? Low content of sodium should be accepted in the diet. Roughly 120 mg/day or less is advised. DASH diet associates significant drop in systolic blood pressure with the lower sodium content. Salt, however, is a major component that makes food palatable. Other options to replace this ingredient are acids (like citrus and fruit juices, vinegar) and potassium chloride. The latter should, of course, be avoided in patients with kidney dysfunction. Potassium chloride should also be avoided in people who are using certain medications, namely lithium and potassium-sparing anti-hypertensives. Other spices may also be helpful- garlic, onion, herbs. In those people who have no option but to buy commercially available foods, use foods with “no added salt’ or ‘low salt’. While patients initially feel the food to be bland, they adapt quickly to low salt foods. Surprisingly, even total avoidance of salt reduces sodium excretion by just 15%. What Happens When One Takes too Less Salt? Patients who take too low salt may develop problems related to hyponatremia, e.g., muscle cramps, altered sensorium, etc. On the flip side, low salt in the diet should be avoided in salt wasters (part of renal or gastrointestinal disease in some patients), and pre-eclampsia (It is a condition with high blood pressure and extremely high protein content in the urine of pregnant women). Reduce your salt intake. It is a small price for living healthy.